General Motors posted the strongest growth among the Detroit 3 with a 5.1 per cent increase. There’s still plenty of time for the wheels to come off, but so far 2017 vehicle sales continue to defy forecasts of a slight slowdown from 2016’s record pace. Automakers sold 123,032 vehicles in Canada in February, setting a new record for the month, according to numbers released by the Global Automakers of Canada. 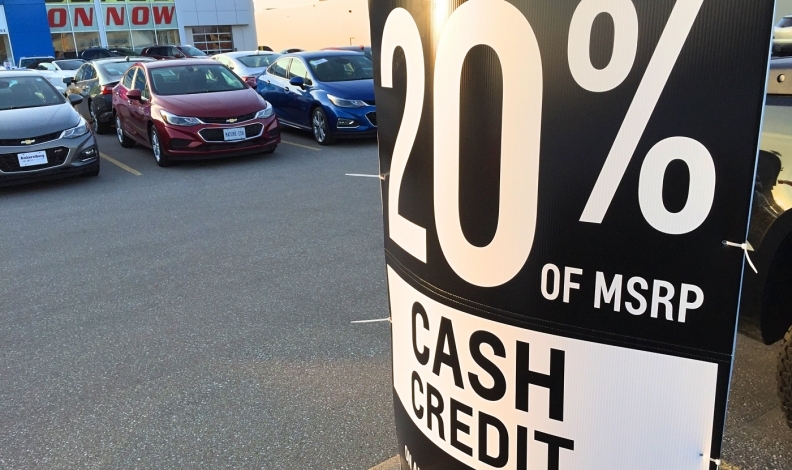 Sales grew 3.2 per cent in February, following a 2.4-per cent advance in January. The February spoils were shared evenly between the Detroit Three and the global automakers, though it was Detroit that presented a more united front: FCA, Ford and GM all posted modest gains, for a combined uptick of 3.1 per cent. Total sales of the rest of the world improved by a similar amount, but that was an average of results that varied widely on a company by company basis. Among the larger players, performances ranged from Honda Canada’s dramatic 21-per cent surge to Hyundai’s 10.6-per cent sag. Toyota Canada was also a laggard, down 6.2-per cent despite February record sales for several models, including a surprising 36-per cent spike for the Corolla. European luxury brands continued to ride high. Among the Detroit Three, GM achieved the strongest growth – 5.1 per cent -- but that wasn’t enough to lift it out of third place. Ford’s 3.1-per cent gain beat FCA’s 1.5 per cent, but not enough to get it back into first place: FCA retained that title both for the month and year-to-date. The latter is a pattern that has been repeated for several years: Windsor starts each year in front but (with the exception of 2015) Oakville pulls ahead by the end of the year. Surprisingly, FCA’s growth was all on the car side (up 27 per cent) while light trucks stood still. FCA’s truck mainstays, the Dodge Grand Caravan and Ram pickup, were strong in February but a slide on the Jeep side – and a huge decline by the Ram Promaster City van from an unusually strong year-ago month – left total truck sales treading water. Among FCA’s car results: the first recorded sales (three) of the new Alfa Romeo Giulia sport sedan. Ford meanwhile was consistent with industry trends: car sales slumped 11 per cent, while the F-150 pickup set a February record as it led Ford/Lincoln light trucks to a 5.3-per cent advance. Overall it was Ford of Canada’s best February since 2000, fuelled mostly by strong gains for its SUVs and commercial vans. Vans and SUVs also did the trick for GM of Canada; its overall trucks sales grew 11.6 per cent while passenger cars slid 13.1 per cent. Curiously, GM reported the Bolt EV sales (86, in its first full month) in the truck category. Bottom line: light trucks represented 87 per cent of combined Detroit sales in February.